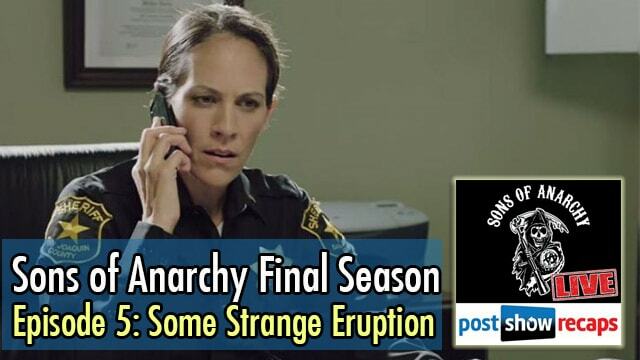 Rob Cesternino (@robcesternino) and Josh Wigler (@roundhoward) recap episode 5 of the final season of Sons of Anarchy, “Some Strange Eruption”. Join us LIVE Tuesday, October 7th at 11:30pm ET / 8:30pm PT. 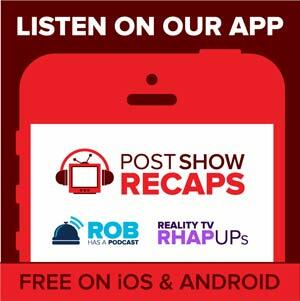 What happens next after the standoff between Gemma and Juice at the end of the episode? What was Gemma’s plan for Juice in the first place? Why was Unser so quick to help Juice get rid of the body of an innocent person that got killed? How guilty did Peter Weller’s character of Boraski seem after he shot the guy in the pawn shop? What is his role in the betrayal of the Sons Of Anarchy? What storyline is shaping up after the two scenes with Abel talking about how he has to protect his family? What will Nero do now that he has chosen the Sons over working with Lin? Will there be blow back after Jax outed Nero to Lin and the Triad? What will happen in with the relationship between Sheriff Jarry and Chibs? How much did Jury tell Lin about the Sons raid of the Chinese gun and Heroin deal? Could Jax and Wendy possibly end up back together at the end of the Season? Will we see any more of the Venus and Tig relationship before the end of the season? Will the update be only in a montage? Be sure to join us next week on Wednesday, October 15th at 10:30 am ET to discuss the next episode of Sons of Anarchy.